14/123 David Mumpower "It's so fluffly!" is my favorite random quote of 2010. 53/190 Max Braden My favorite moment is the minion accidentally floating into the atmosphere. And his car. The rest is too slow and missing essential charm. There doesn’t seem to be any major animated feature film where the main character is actually the villain of the piece. Maybe studios were afraid of a backlash given the kind of role models they would be producing for children. And so we come to Despicable Me, an animated feature that will corrupt children across the world with the introduction of evil mastermind Groo. Groo's latest evil concoction is to steal the moon. Now quite why anyone would want to steal the moon I don’t know, unless he’s trying to start a war with Muslims by stopping them from celebrating Eid. Plus, he’s going to need to hide it somewhere a bit bigger than his cupboard, like maybe a garage. All villains have a helper and Groo has the added bonus of having his evil mother lend a hand. However, before Groo can even begin, he is forced to rethink his scheme after a trio of orphan girls come under his care. Chris Meledandri is the producer. Previously the head of Fox Animation, he oversaw Blue Sky Studios. Their four features included Ice Age, Ice Age 2, Robots and Horton Hears A Who. You don’t need me to tell you that they’ve all been hits, amassing over $1.5 billion worldwide. 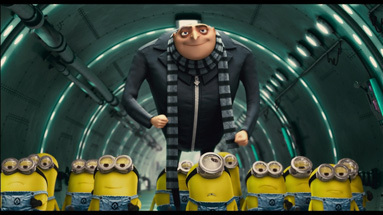 Despicable Me marks the first film released from his production company Illumination Entertainment, a new unit set up at Universal focusing specifically on family films. There are a trio of directors. Sergio Pablos, who worked as an animator for Disney on Hercules and Tarzan; Chris Renaud, who worked as a storyboard artist on Ice Age 2 and Horton Hears a Who; and Pierre Coffin, who unfortunately hasn’t really worked on anything of major interest. The screenplay is by Ken Daurio and Cinco Paul, the duo responsible for Horton Hears a Who (yes, that film again). They’ve clearly written something extraordinary here; especially when you look at the cast they’ve managed to rope in. Steve Carell voices Groo and is joined by Will Arnett, both of whom worked on Horton Hears A Who (and that’s the last time I’ll mention Horton). Plus there are Russell Brand and Jason Segel, both having worked on Forgetting Sarah Marshall. Also included in the line up is Julie Andrews, ditching her wholesome image as Groo's evil mother, and The Foot Fist Way’s heavily in demand Danny McBride. One can only hope that the cast is given a little flexibility with the script.